"Organizing Your Youth Soccer Team"
Here is my review of the book that makes coaching soccer fun and pleasurable experience. If you are not a coach yet, it'll help you to become one. If you are a coach already, it'll help you to become better one. This section of the book covers the more general topics related to coaching soccer: coaching philosophy, goal setting, communication, organizing a new or existing program, and similar topics. This part of the book describes the mechanics of setting up and directing practice sessions. It includes elements of good offensive and defensive plays, use of practice space, key concepts to emphasize during practices and how to account for player size and skill level. The last segment contains over 100 soccer drills and exercises equally effective for both beginners and advanced players. It covers all the most important categories of soccer skills and tactics: passing, shooting, heading, feints, wall play, leaving, overlapping, defensive plays and goalie practice. What's great about this book, is that first two parts will help you tremendously set up and organized your program, team and practices. Believe me, it's an awesome, easy to follow step-by-step instruction how to start your coaching "job". The best part: You don't have to know anything about coaching soccer at all! and not necessarily to coach only soccer but any other youth sport. 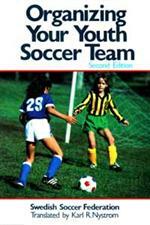 Actually this book will benefit any youth coach of any sport. However, the third part relates only to the game of soccer. The drills and exercises are well explained with illustrations, descriptions and instructions. Of course I understand that you can get probably 1000's of free (I always question quality of free stuff) drills on the Internet. And that's good. Bigger selection allows us to have a variety of choices. The only problem is with making the right choice. That's why "Organizing Your Soccer Team" is so unique. Every set of exercises follows very well written introduction and explanation. You'll know instantly when, where, why and how to implement these drills into your practices. And that's probably the essence of teaching skills and tactics. After mastering this book you'll be able very easily to pick and use the drills, which are right for your team, from any source. You'll be coaching soccer with full confidence. "FUNdamental Soccer for Clueless Parents"
"Make Friend with the Soccer Ball"
These two books, fantastic supplement for "Organizing Your Youth Soccer Team", transfer the whole package into Full Manual for Coaching Soccer. What Should the Goalie Practice?